Are you tired of working with companies who simply aren’t up to the standards you are looking for? Look to your local Annapolis plumbing experts at Heidler, Inc. Call us at (410) 268-7191 to schedule an immediate visit from one of our technicians. Want to save on your next service? Click here to visit our specials and discounts page. 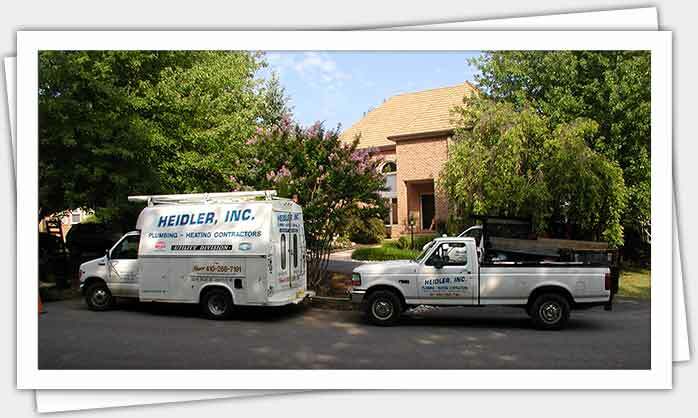 Your neighbors know Heidler, Inc. as their go-to Annapolis plumber. We provide full-service plumbing solutions throughout the area. Sewer lines, drains, and water heaters are among the most common areas we are asked to inspect. To see what customers have been saying about our services, click here to visit our reviews and testimonials page. If a failing sewer line is not handled right away, it can wreak havoc on your pipes and cause sewage to back up through your toilets and even on your lawn. If any of these are present, your sewer line should be inspected as soon as possible to prevent further damage to your home. What are some signs your home needs professional drain cleaning? Our comprehensive drain cleaning solutions will remove any blockage and return your drain and sewer lines to normal. We have the tools to locate the blockage and completely remove it, so your drains stay clog-free for the long term. No matter what is creating problems in your pipes, we have a solution for you. We can even remove stubborn tree roots and other debris that have been clinging to pipe walls using advanced hydrojetting services. This highly effective service can also refresh older pipes by removing calcium buildup that occurs with age. With our professional drain cleaning solutions, your pipes will turn out like new and their lifespan will be extended. Have you been avoiding replacing your water heater? The average lifespan of this unit is 7-10 years. If you have an older unit that is starting to show signs of failure, you may want to consider a replacement. Installing a new, more efficient unit will help you save on repair bills that may start to pile up as your unit ages. Leaking tank: If you see puddles around the base of the tank, this is a sure sign that the tank is leaking. This is often due to corrosion from minerals and sediments in the water. A leaking tank cannot be handled with a quick repair. In most cases, you will need to replace your entire water heater. Don’t worry—we will help you find the best unit that fits your needs and budget. Poor water quality: Starting to notice rust or sediment in your water? This is another sign that the tank is corroded, and that your water heater will need to be replaced. Lack of hot water: Has there been a change in your water temperature? Are you running out of hot water too soon? There may be an underlying issue with your water heater that calls for a replacement. We will inspect your unit and provide you with a cost-effective option. If your home is experiencing unexpected plumbing problems, from sewer line damage to water heater trouble, call Heidler, Inc. for a consultation. We promise quality service at a reasonable price. Our experts are prepared to tackle any plumbing project and guarantee a solution for you. Call us today at (410) 268-7191 to schedule your next service. We will determine the source of your plumbing problem and get repairs or replacements underway.